With a number of early season races already in the books for some runners and many nigh for the rest of us, it's certainly time - if not past time - to start testing new race equipment. So it was with some urgency that I loaded up my new Nathan HPL #020 hydration pack and headed out the door for a 21 mile test run this morning. And overall, it performed very well, especially for a first time test on a three hour run. I have to admit to some early morning trepidation when I first tried on the pack in the comforts of my kitchen. It just didn't seem to fit that well, no matter how I fiddled with the straps. The pack sat lower on my back than I was used to, and without adjustable shoulder straps there was no real way to change the fit. While the literature that came with the vest said it should fit loose and feel like a "soft hug," this didn't really assuage my concern. Having run the past number of seasons with a more traditional pack from Gregory, I was used to the secure, locked-and-loaded fit it provided. But with time short and the kids needing to get to school, I left my worries on the stoop and headed out the door. And what I found was that after just a few strides the loose fitting, largely nonadjustable, HPL #020 with its "3-way propulsion harness" felt very natural and largely unnoticeable, even filled to 1.5 liters of its 2.0 liter capacity. Aside from its natural feel, the #020 has some other nice features as well. The nozzle locks closed, so you won't get as many inadvertent drips as you would with a regular bite valve. The height of the sternum strap is adjustable to accommodate different body types and to allow tweaking of the fit mid run; it also has a pressure clip so you can easily lock down the hose and keep it from flapping with every stride. The three front pockets are nice as well - two holsters, one zippered - each big enough for a handful of gels, half a peanut butter sandwich, or a digital camera. The biggest drawbacks of the HPL #020 are the size of its pockets and the aforementioned lack of adjustability. The three front pockets are fairly big, but it would be nice for at least one of them to be at least 50 percent larger, so you could keep handy even more calories or a flashlight. An earlier version of the vest had just such a pocket, and it's unclear why it was dropped from the design. 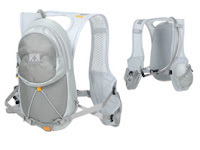 That the vest lacks supreme adjustability is more of a quibble, but given how many hours ultrarunners spend with their packs, it'd be nice to be able to make more adjustments as hot spots develop, as the weight of the pack changes, or as bored minds look for something (anything) entertaining to do. Everything taken together, though, the Nathan HPL #020 is a very good hydration pack. It is full featured, lightweight, and comfortable, and would more than meet the needs of anyone going long in the backcountry. All good points - I have many miles in the first generation pack and really like it. One major drawback for me is the poor quality of their bladders. Everything form holes developing at the welded seams and the seams coming seperated, and always at the worst possible time. I would highly recommend ditching the stock bladder and replacing it with a Camelback brand bladder.